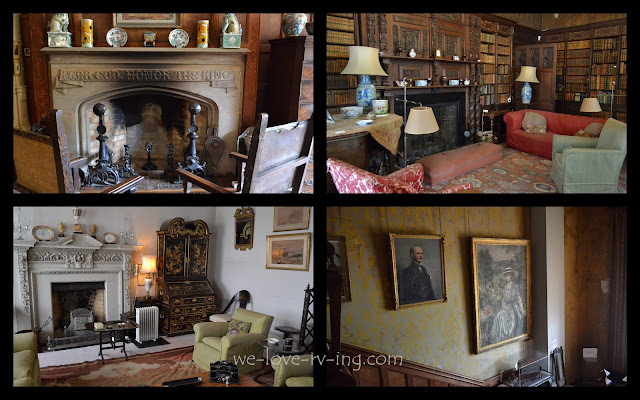 Time spent in England would just not be right without a visit to country estates or castles that have survived the test of time over several centuries. Many of these have been donated and are now owned by National Trust as the families were not able to maintain the upkeep and maintenance required. The word castle derives from a Latin word and describes a type of fortified structure built by nobility. It is usually considered to be the private fortified residence of a lord or noble. Our visit today was to Scotney Castle, which was surrounded by a moat. The main building still stands strong but as you can see, there has been some destruction to other sections of it. This Scotney Castle was built in 1378-80 by Roger Ashburnham, although there are records of the estate being owned by Lambert de Scoteni in 1137, which I would guess determined the name. It is believed the castle was built as a defence again the French forces who had attacked nearby towns in 1377 during the Hundred Years War. There were several architectural changes made during construction over the years. The eastern range was partly dismantled on the completion of a new house in 1843, to allow the ruin to be a “romantic folly” garden feature. The Darrel family owned the estate for 350 years, during which time they hid Catholic priests, as Catholicism was illegal in England at that time. This door is a cupboard size, which leads to the hiding place the priest would go to when visitors arrived at the house during the years 1591-1598. Jesuit Father Richard Blount, S.J. fled over a wall into the moat and escaped during the second raid when authorities came to arrest him. It was 1778 when Edward Hussey bought the Scotney Castle. His grandson, also Edward built the ‘new’ castle from sandstone that was quarried from the estate. The quarry later became the Quarry Garden. The new castle sits on a hill overlooking the picturesque spot down in the valley where the ‘old’ Scotney Castle sits, with the garden filling the space between. The Hussey family used the old Scotney Castle mainly as a country home for 58 years. There was nothing fancy about the inside of this old castle, it was very plain but the main purpose when built had been for defence so it wasn’t surprising to learn that with the wealth from the iron industry in the family, Edward Hussey lll decided to build a new castle. The Scotney Castle had been lived in by someone of the Hussey family from 1778 until 2006 when the last family member, Elizabeth (Betty) Maude Hussey passed away at the age of 99 years. It became the property of National Trust in 1970 but was kept as a family home for Betty until she passed away. The National Trust opened it to the public in 2007 and has maintained it to look like it was still the Hussey family’s country home. We had a walk around inside the new Scotney Castle that was filled with lots of carved walls and ceilings, books shelves filled with their old books, large portraits lined the walls in the staircase, beautiful fireplaces with carved words, the quality of the work has well survived these many years. It was totally luxurious compared to the Old Castle. There have been several apartments on the estate that were rented out by the Trust. In the 1970’s and 80’s it served as a country retreat for then Prime Minister Margaret Thatcher. It is easy to understand why someone would choose this beautiful place to relax. In spite of the many other visitors that were there during our visit, it was quiet and serene with the magic of the past showing us around. Spend some time with us at Knole House, just click here..